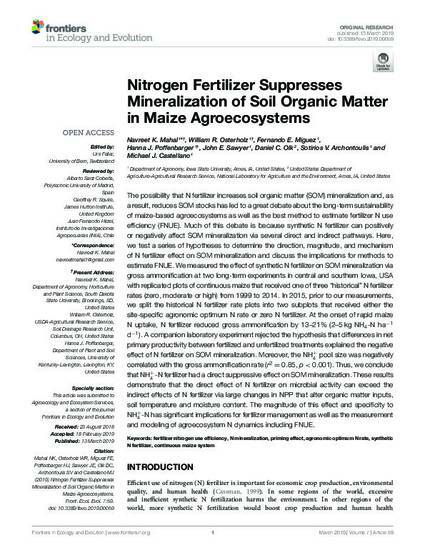 The possibility that N fertilizer increases soil organic matter (SOM) mineralization and, as a result, reduces SOM stocks has led to a great debate about the long-term sustainability of maize-based agroecosystems as well as the best method to estimate fertilizer N use efficiency (FNUE). Much of this debate is because synthetic N fertilizer can positively or negatively affect SOM mineralization via several direct and indirect pathways. Here, we test a series of hypotheses to determine the direction, magnitude, and mechanism of N fertilizer effect on SOM mineralization and discuss the implications for methods to estimate FNUE.Wemeasured the effect of synthetic N fertilizer on SOMmineralization via gross ammonification at two long-term experiments in central and southern Iowa, USA with replicated plots of continuous maize that received one of three “historical” N fertilizer rates (zero, moderate or high) from 1999 to 2014. In 2015, prior to our measurements, we split the historical N fertilizer rate plots into two subplots that received either the site-specific agronomic optimum N rate or zero N fertilizer. At the onset of rapid maize N uptake, N fertilizer reduced gross ammonification by 13–21% (2–5 kg NH4-N ha−1 d−1). A companion laboratory experiment rejected the hypothesis that differences in net primary productivity between fertilized and unfertilized treatments explained the negative effect of N fertilizer on SOM mineralization. Moreover, the NH+ 4 pool size was negatively correlated with the gross ammonification rate (r2 = 0.85, p < 0.001). Thus, we conclude that NH+ 4 -N fertilizer had a direct suppressive effect on SOM mineralization. These results demonstrate that the direct effect of N fertilizer on microbial activity can exceed the indirect effects of N fertilizer via large changes in NPP that alter organic matter inputs, soil temperature and moisture content. The magnitude of this effect and specificity to NH+ 4 -N has significant implications for fertilizer management as well as the measurement and modeling of agroecosystem N dynamics including FNUE. This article is published as Mahal, Navreet Kaur, William R. Osterholz, Fernando E. Miguez, Hanna Poffenbarger, John E. Sawyer, Daniel C. Olk, Sotirios Archontoulis, and Michael J. Castellano. "Nitrogen fertilizer suppresses mineralization of soil organic matter in maize agroecosystems." Frontiers in Ecology and Evolution 7 (2019): 59. doi: 10.3389/fevo.2019.00059.